Tritium will be exhibiting at Advanced Clean Transportation Expo. You are invited to visit Tritium’s booth #1712 and talk to us about DC fast charging and High Power Charging (HPC) infrastructure for electric vehicles. We offer solutions for charging networks, utilities, fleet operators and more. 1. 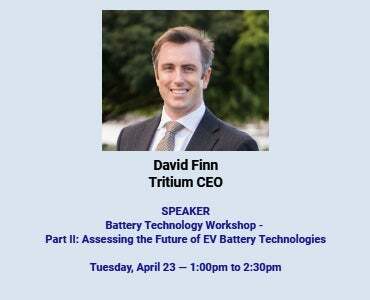 Tritium has one of the largest deployments of EV fast chargers in the US. Find out why you might not have heard of us! 2. Tritium has 20 years experience designing the most efficient, smallest, highest reliability fast chargers. 3. See our range of products from ''Level 3'' 50 kW chargers up to the fastest chargers in the world, 350 kW. 4. Find out about the largest fast charging network in the world, and how it is being powered by Tritium. 5. We have just been named in Fast Company's 2019 List of the World's Most Innovative Companies! The largest advanced transportation technology and clean fleet event. At Tritium, we want everyone to enjoy clean, healthy and convenient cities. Our company is committed to energy freedom and we are continually developing technologies and products that will enable the world’s EV owners to maximize the benefits of their vehicles. As both a convenient mode of transport and a mobile energy asset. By designing a range of products which support the uptake of EV’s, Tritium’s aim is to lower the barriers that can prevent transition to e-mobility.